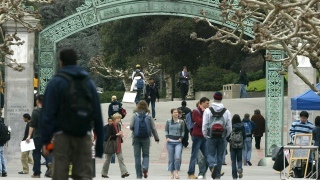 File image of the UC Berkeley campus. A woman was sexually assaulted at a UC Berkeley fraternity party on Saturday, police said. According to a statement from campus police, security personnel reported the crime, which occurred in the Berkeley police department’s jurisdiction. It remains unclear where the fraternity house was located. People with information about the assault are asked to call Berkeley police at 510-981-5900.